Mumbai : The Promotion of a film is always seems the key to theater occupancy in presently. Akshay Kumar’s Gabbar is Back movie also did the same old thing however with a new ingenious notion. Post slotting us with small talks, now Akshay Kumar upcoming movie, has eventually uncovered its first poster. Gabbar is Back poster unveils Akshay Kumar as the new era Gabbar, highlighting two divergent characters, one of a hero and another of villain, donning a rugged and beardy avatar. 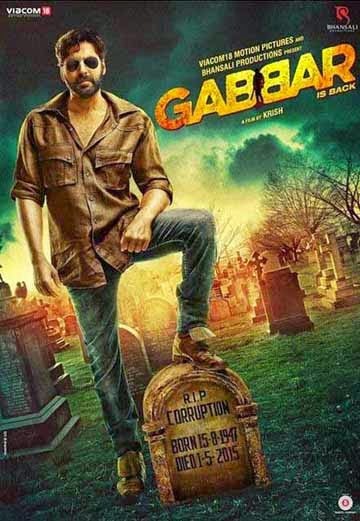 The ‘Baby’ star is looking dynamic and forceful in the new Gabbar is Back Poster. The poster overstates its mood with the strong punch line ‘Naam Villain Ka, Kaam Hero Ka’! In one of the poster, Akshay Kumar could be seen standing with one foot on gravestone captioning RIP Corruption. Born 15.8.1947 Died 1.5.2015 on the contrary other poster depicts a high octane still from Gabbar is Back Movie. With the release of the new poster the promotions of the film that has already been in swing, has now elevated to the next level. Soon you would get to see the end of Corruption (as the flicks suggest) in your near theaters on May 1st of 2015.